This method is obsolete. By openocd warning message, you should use libftdi. 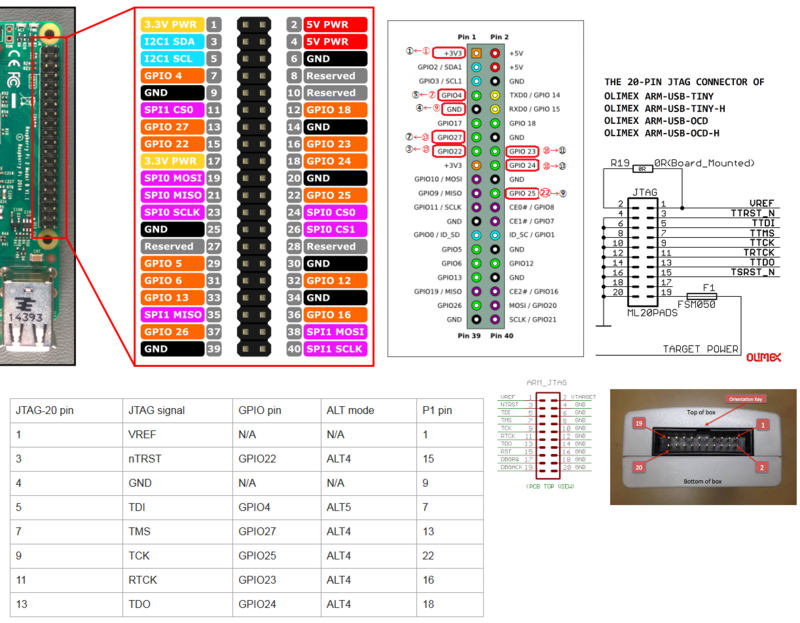 ft2232_device_desc "Olimex OpenOCD JTAG ARM-USB-OCD-H"
from here Thanks jitomesky! I bought your book! $_TARGETNAME configure -event reset-assert-post "cortex_a dbginit"
Now connection established, you can see the brinking LED on top of ARM-USB-OCD-H.
Download gcc-arm-none-eabi-4_9-2015q1-20150306-linux.tar.bz2 or later from here . Download special bootcode bcm2836-raspi2-bootblk.bin.ift from here and concatenate . cpsr: 0x600001da ... Mode field(bits [4:0]) indicates that we are in HYP(0b11010). umm... openocd-0.9 does not recognize Hypervisor mode of Cortex-A7 MPCore architecture correctly. About details, refer to the "How to enable debugging in HYP-mode" described below comment. bootcode.bin is the GPU bootcode - nothing to do with the arm startup code. The arm boot code we use is here and you can easily use kernel_old=1 and prepend your own bootcode to the kernel if you want to change it. By default we insert some startup code at address 0x0 - 0xff, which comes from here. This does switch to non-secure monitor mode, which is required to write to CNTVOFF. For bare metal I'd have thought you'd want to avoid our startup code (with kernel_old=1) and start your kernel from 0x0. * We use only r0 and r1 here, due to constraints in the caller. /* DDI0406BJ_arm_architecture_reference_manual.pdf pp.1160 "Format of the CPSR and SPSRs"
* A, bit  ... 1(Exception disabled) Asynchronous abort disable bit. Used to mask asynchronous aborts. * I, bit  ... 1(Exception disabled) Interrupt disable bit. Used to mask IRQ interrupts. * F, bit  ... 1(Exception disabled) Fast interrupt disable bit. Used to mask FIQ interrupts. * T, bit  ... 0(Not Thumb) Thumb execution state bit. b0:       e35000ff        cmp     r0, #255        ; 0xff  @ I think this should be 4, because Core x Mailbox 3's upper limit is 3. Perhaps, special bootcode bcm2836-raspi2-bootblk.bin.ift has built from nonsec_virt.S . bits of r1 is 0b 0110.0011.1111.1111.1111. Core 1, 2 and 3 are wait till Mailbox 3 becomes non-zero. I could not find useful information. I have to learn more about breakpoint management under HYP. the breakpoint to be conditional on the security state of the processor. Breakpoint state control fields on page C11-2217 for possible values. This field must be programmed to 0b00 if DBGBCR.BT is programmed for Linked Context match. If this is not done, the generation of debug events by this breakpoint is UNPREDICTABLE . in which the access matches, not the required security attribute of the access. See also Generation of debug events on page C3-2076. This field is used with the SSC, Security state control, and PMC, Privileged mode control, fields. See Breakpoint state control fields on page C11-2217 for possible values. this is not done, the generation of debug events by this breakpoint is UNPREDICTABLE . PMC, bits[2:1], Privileged mode control. This field must be programmed to 0b11 if DBGBCR.BT is programmed for Linked Context match. The meaning of this bit is: 1 = Breakpoint enabled. A breakpoint never generates debug events when it is disabled. BAS, bits[8:5], Byte address select. This field enables match or mismatch comparisons on only certain bytes of the word address held in the DBGBVR. Transfer rate: 29 KB/sec, 15281 bytes/write. Research: Outer Cache prevents JTAG debugging? I 0b1 Instruction cache enable bit: This is a global enable bit for instruction caches, for memory accesses made in Hyp mode. C 0b1 Cache enable bit. This is a global enable bit for data and unified caches, for memory accesses made in Hyp mode. M 0b1 MMU enable bit. This is a global enable bit for the PL2 stage 1 MMU. I have lost GDB debugging control after isb or dsb instruction. Add a line gdb_breakpoint_override hard to openocd-rpi2.cfg (config file for openocd). OpenOCD error message says data about occured. I guessed this might be caused by using memory mapped debug registers. DAP(0xc0010000, 0xc0012000, 0xc0014000, 0xc0016000) described in openocd-rpi2.cfg are VideoCore's bus-address, not ARM side physical address. But, JTAG might use peripheral via ARM physical memory range 0x3f000000 to 0x3fffffff(VideoCore map that range to peripheral bus addresses 0x7e000000 to 0x7effffff). Investigate this hypothesis in next comment. If TLB matching is disabled, and TLB maintenance functions have not been correctly performed by the system being debugged, for example, if the TLB has not been flushed following a change to the translation tables, memory accesses made by the debugger might not undergo the same virtual to physical memory mappings as the application being debugged. Therefore some debugger disable outer(L2) cache. • changes to system control registers. Any context-changing operations appearingin program order after the ISB instruction only take effect after the ISB has been executed. Conjecture 3: gdb step command using rewrite instruction cause broken cache coherency. From openocd debug log message with -d 3 option. Otherwise, according to cortex_a.c it looks like using hardware break point. GDB 'step' packet reqired BKPT_SOFT. The key for solution is gdb_breakpoint_override_type. Add a line to openocd-rpi2.cfg (config file for openocd). Thus, now step working with hardware breakpoint. OpenOCD(=gdbserver) does not recognize that Hypervisor MMU has been enabled. In this current situation, this matter does not affect the function of step. Because, we have just set the hypervisor level1 TLB to straight map between virtual address and physical address. However, by another aspects if we have different mapping between virtual and physical then we should treat properly the status of hypervisor MMU. M controls Non-secure PL2 stage 1 MMU. VM controls Non-secure PL1&0 stage 2 MMU. This context is under the setting of Non-secure PL2 stage 1 MMU (HTTBR and HTCR) . * 16MB is same size as Supersection memory block (24-bit offsets). * which associates (8 * 2)MB memory region will be allocated assigned. +               ttbl[index] |= (writeable) ?